We manufacture and supply a comprehensive range of high quality asbestos packing products, non-asbestos packing products, non asbestos packings materials for various requirements. Developments in different industrial fields and areas demand high-tech packings and to fulfill those requirements, we offer innovative and high performance products ensuring top functional reliability. Utilizing our long experience of 35 years and through continuous R&D, we are capable to satisfy various requirements through our quality products. Our non asbestos packings materials, asbestos packings include solutions for steam & super heated steam; oil and solvents, acids, alkalies and chemicals; marine & hydraulic water and oil. A reliable asbestos packaging solution for hot gases, oven, autoclaves and more. Utilizing the latest technology, it is made of quality materials and is available in different specifications to suit various requirements. The given table shows the style number, temperature ranges and service recommendations. 1000 350 Asbestos dry plaited general steam and insulation packing for hot gases, oven, autoclaves etc. conforming to IS Specn. 4687 / 1968 / 1980 and DGS & D Specifications. 1100 325 Lubricated and graphited, general-purpose asbestos packing for Glands for medium pressure conditions conforming to IS Specn. 4687 / 1968/ 1980 and DGS & D Specifications. 1200 350 Incorporated with white metal wire for low friction and greater mechanical durability. Suitable for rotary shafts with peripheral speeds upto 1750 ft/ min. Recommended for steam, hot water, weak acids and alkalies. 1300 500 Brass wire reinforced asbestos yarn packing. Specially suited to high speed rotary and reciprocating shafts even at higher temperature and pressure. Incorporation of brass wire improves its strength and anti-friction properties. It is recommended for saturated and super heated steam, hot water, air, gases, oils, steam expansion glands, rotary and reciprocating equipments. 1800 490 Non-metallic asbestos lubricated and graphited packing for high pressure saturated super heated steam conforming to IS Specn. 4687/ 1968/ 1980 and DGS & D Specifications. 1850 490 Same as above, but lubricated non graphited version meant for Stainless Steel Rods. 1900 540 Crysotile white dry asbestos fibre yarn of high purity braided packing non-metallic used where severe high temperature conditions prevail. 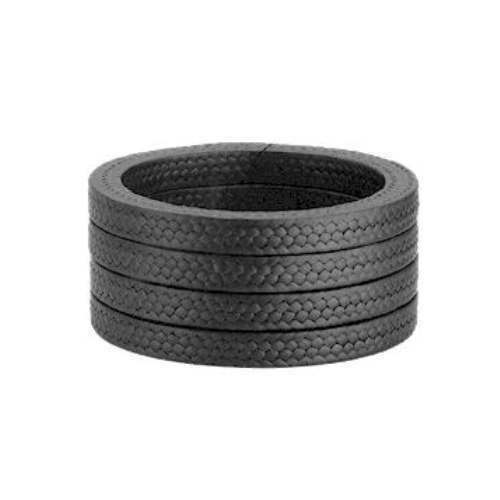 Best suited for expansion joints, door ovens, caulking of joints, exhaust pipe wrappings, ductings etc. Asbestos Packing For Oil & Solvents, Acids, Alkalies, and Chemicals.Made of superior grade asbestos yarn, which is impregnated with oil resistant synthetic compound through a controlled process, this product is suitable for packaging of oils and solvents, acids, alkalies, and chemicals. Superior in strength and chemical properties, this product is available at most reasonable prices. The given table shows the specifications - style, temperature and service recommendations. 1003 -150 to 300 A combination packing concentrically braided with a special compound to resist hot concentrated alkalies, organic and dilute acids. A very special low friction packing recommended being used with high-speed pumps, agitator shafts, oils, solvents, ammonia solution, concentrated caustics, and ketones. PH 2-12. 1 -200 to 290 A super fluorocarbon fiber interbraided packing. This packing is developed for pumps, valves, mixers, agitators involving applications for highly corrosive chemicals, oxygen service, acids, and alkalies. PH 0-14. 2 -200 to 290 A 100% pure PTFE packing impregnated with a special chemically inert suspensoid A good packing for control valves, pumps handling corrosive gases, ammonia, foodstuffs and pharmaceuticals. It is an ideal packing for sealing dryers, mixers, and agitators. Due to a high tensile strength of the fiber, this packing is best suited to be used in high-pressure valves and reciprocating pump applications. PH 0-14. 23 -250 to 300 A Duplex plaited flexible combination packing having super grade fluoropolymer intimately treated with graphite to enhance lubricity and heat dissipation. This packing is self lubricating mechanically strong and widely used in chemicals, petrochemicals, power plants, paper, pulp and food industries. PH 0-14. We offer specially designed asbestos packaging solution for marine & hydraulic water and oil applications. Designed keeping the various marine, hydraulic water and oil packaging requirements in mind, this product is superior in strength, durability and delivers quality results. 2222 130 This is a specially developed lubricated non-graphited long vegetable fibre braided packing for marine applications. It has been further lubricated with a low friction dry lubricant to enhance anti-friction property for use in sea water and fresh or river water applications, water wheel shafts or rudder and stern glands. 2224 150 The most critical parts to seal in a ship are the stern tubes and the rudder post. With this view in mind, a most reliable packing is specially developed from non-asbestos tough vegetable fibres. The packing is impregnated with lubricants which protect the packing structure. This packing is therefore most suited for use in marine against sea water in rudder posts and stern tubes, oils, weak alkali solutions and in paper plants. 2300 130 This packing is manufactured from high tensile strength vegetable fibre thoroughly impregnated with a special lubricant and graphite. Suitable for fresh and salt water, pen-stock and heavy duty hydraulic applications. 376 130 A special non-graphited soft natural fibre yarn packing impregnated with first grade lubricant suitable for high speed centrifugal pumps, compressors and refrigerations, D M Water, cooling water and condensate pumps. Owing to the pliable nature of the material used this packing permits free motion of the rod. 374 150 Duplex Braided fine soft vegetable fibre packing self lubricated. Each strand of this packing is specially impregnated with additives alongwith break-in lubricant having the property of self-lubrication and media repelling action This packing is best suited to seal glands of pumps, valves, handling condensates, demineralised water and for cold and hot hydraulic applications. 3116 130 A fine natural fibre braided packing impregnated with lubricants and graphite recommended for use on reciprocating and rotary pumps, valve spindles, refrigeration machinery and compressors. The packing presents a smooth surface that will not score shaft or sleeves because the soft fibre constantly absorbs the liquid being pumped and maintains a soft and pliable running face on the shaft. 600 'A' Steam 280 An asbestos proofed semi-metallic packing with strips of white metal intermittent layers embedded. Used on steam expansion glands, marine engines, compressors, pumps, winches and hoists. A special high pressure medium temperature packing for ships and ship building industry, sugar mills, etc. 143 Metaflex A 560 Aluminium foil, crimpled under mechanical process with high grade lubricants, sealed in layers and folds built around asbestos or non-asbestos rovings. The packing lacks resilence but permits compressibility. Used for high peripheral speeds on rotary crude oil pumps, petroleum distillates, steam compressors, turbines, hot oil valves, brine, hydrocarbons etc. Shafts should be of 500 brinell hardness or over. 146 Metaflex L 300 A soft white metal foil anti-frictional packing similar in construction as above for high peripheral speed. The packing is soft enough to present the shaft with a bearing alloy that reduces scoring. Recommended for fuel and crude oil, fresh or salt water refrigerator pumps, air compressors, abrasives, crystallizing or congealing liquids such as sugar, asphalt and medium temperature slurries. 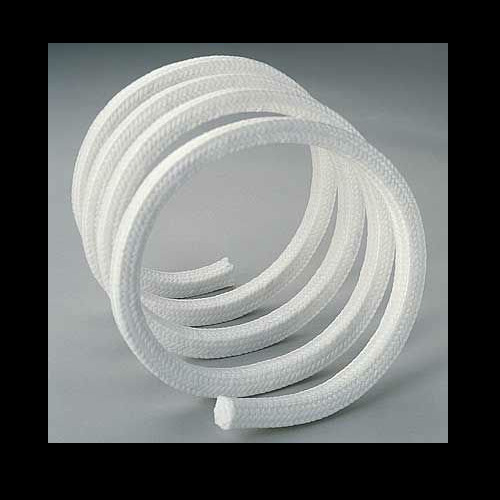 It is also used as anti extrusion rings in combination with regular braided soft packings. 789 C Ammonia 130 A soft flexible laminated proofed fabric packing impregnated with lubricants which reduce friction and shaft wear to a minimum Used extensively in ammonia and refrigerating pumps, compressors and water service. 777 Auto Lip 130 A fine fabric composition precision packing with a lip section for automatic self sealing service on accumulators, press rams, cranes and reciprocating rods under heavy duty hydraulic application. 778 Auto Lip Metallic 130 A packing similar in construction as above but with white metal pegs embedded on rod surface increasing bearing property. Not suited for non-ferrous soft metal rods. 714 Oelit 130 A proofed fabric packing with synthetic compounds to resist service conditions of oils, petroleum distillates, solvents and hydrocarbons.